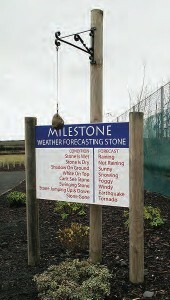 We wanted a more accurate weather solution, one which could indicate temperature, wind speed and direction, rainfall, and barometric pressure, and ideally send the feed to the internet so everyone interested in the area could benefit. Of course, our budget wasn’t unlimited either, so plunking down $35,000 for a prepackaged solution was out of the question. With all this in mind, our investigation led us to a Davis Vantage Pro 2, plus some additional equipment to allow an easy connection to the internet. Having decided on the appropriate equipment, we turned to other requirements. There are many standards dictating how the equipment must be located and mounted. For example, the temperature sensor has to be a certain distance from the ground, the wind anemometer has to be a different distance from the ground and it all has to be located far enough away from other obstacles. And there are further considerations. Ideally the anemometer should be ten meters from the ground when used for aviation purposes. But for local weather stations in farming communities, three meters is acceptable and gives a better reading of weather near the ground while being less of a target for lightening. While the station itself is primarily solar powered (with a battery backup), maintenance is always an issue. For example, we have to deal with bird droppings frequently gumming up the works! Recently its fan has been acting up, so a new one has been ordered. And one of these days we should probably send it in for an extensive (and expensive) recalibration. Weather.com has recently acquired Wunderground and they have also begun to incorporate information from local weather stations. Since we installed this station over five years ago, the availability and pricing for entry level weather stations has dropped significantly and other weather stations have begun to appear in the area. 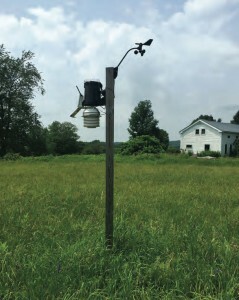 Personal weather stations can range from about fifty dollars to thousands, depending upon the features and accuracy preferred. We hope others will consider joining the fun too!